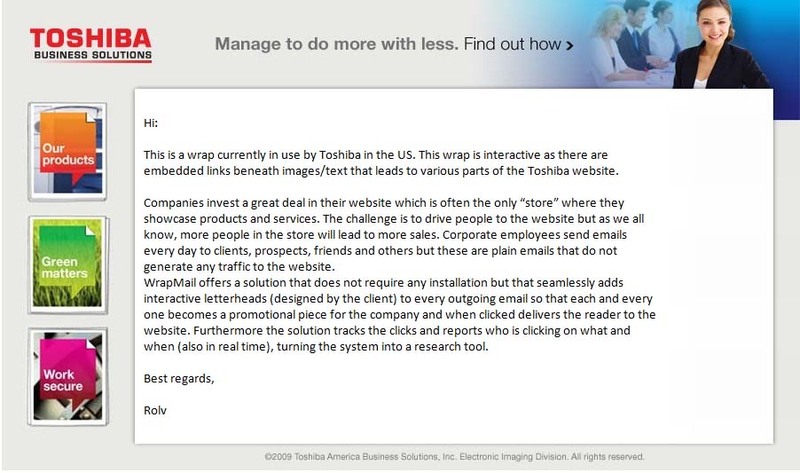 Toshiba Business Solutions (TBS) has today signed up with WrapMail to use WrapMail’s Enterprise Solution. WrapMail will install its propritary software in TBS’s datacenter and initially TBS will use WrapMail for 750 employees accross North America. The Enterprise solution includes the WrapMaker (Patent Pending) where TBS can make an unlimited amount of wraps (a “wrap” is a dynamic and interactive letterhead for regular emails) and further set rules as far as who will be using what wrap when, either individually, by department or rotation. Furthermore the solution includes full tracking of the interactive elements of the wraps by sender, recipient, subject and timestamps. WrapMail Enterpise also includes a campaign module where TBS can upload email lists and send campaign style emails to a large audience. As with all WrapMail’s solutions nothing will be installed on any desktop/laptop computer or cell phone and no routines change as far as the senders are concerned. WrapMail’s solution is one where all emlements are embedded in the email itself (images and links) and thus these show up on the recipients end without images being blocked and having to be downloaded. WrapMail is compatible with Google Analytics. Toshiba Business Solutions will now be able to take advantage of the facts that they have web pages and employees that send external emails every day anyway. WrapMail enables every email and every sender to become part of TBS’s marketing effort and the esitmated number of branding impressions for 750 senders is about 75,000 per month according to WrapMail’s statistics. Statistics further show that 5-10% of these emails will result in a click and thus a visit to a TBS web page. We all send emails every day, with WrapMail senders now inform the reciving audience via images, text and links of all the products and services the senders company has to offer.